by Chartered Physiotherapist, Filipa Barnes. with an exceptional standard of physiotherapy care for everyone. We can treat any pain you have in your muscles and joints. We can also prevent problems from re-occurring. Early intervention will speed up recovery and minimise tissue damage enabling a quicker return to sporting activities. Our physiotherapists have a wealth of experience at treating problems afecting the neck and back. 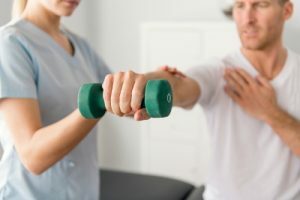 Working out of two sites, one in Storrington and also at the Pulborough Medical Centre, we have extensive experience in the assessment, treatment and prevention of a wide range of musculoskeletal conditions. Our aim is to reduce pain, aid recovery and get you back to previous activities as soon as healthily possible. Our physiotherapists are registered with the Chartered Society of Physiotherapists (CSP) and the Health & Care Professions Council (HCPC) and each offer over 10 years’ experience. Our clients come to us from word-of-mouth recommendations as well as from GP and Consultant referrals, and from Health Insurance Companies. We are happy to discuss any concerns or offer advice over the telephone. If we are unable to answer and we will call you back as soon as possible. Feel free to make an initial enquiry through our Contact Page.